Commenting Giveaway Alert: This week we will draw a name from all the comments left on this week's new posts and give away a $5 gift certificate! The more posts you comment on, the more chances you have to win. We promised our followers some great new product introductions this month and we certainly wouldn’t want to disappoint! Our two most popular rubber stamp Lines have just gotten bigger. From The Greeting Farm, Miss Anya and Ian are now available in new designs and we also have some new seasonal/scenic stamps to ring in the holiday card making season. Come meet our newest characters from CC Designs. 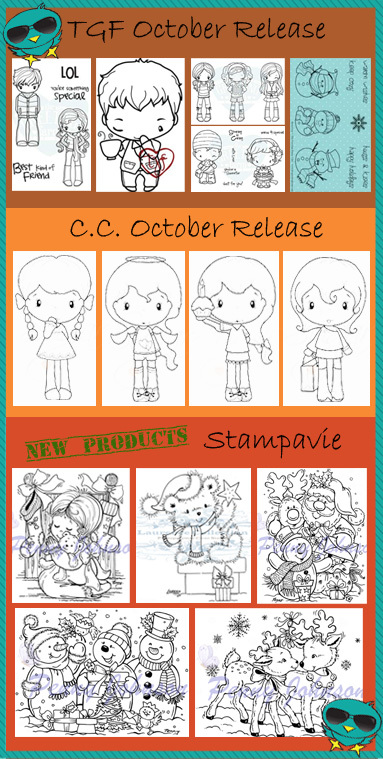 Stampavie Stamps is the newest addition to our stamping family, Stapavie offers some of our favorite Christmas stamps and we are thrilled to be offering them now on iCopic.com. The way we see it, stamps can be used to make gifts or given as gifts, so if you need some inspirations for holiday cards, come check out our newest character and holiday additions. On that note, we want to Wish everyone a Happy Columbus day, and if you’re one of the lucky few who will be having a 3 day weekend and no plans for the extra day off, be sure to enter our Copic Challenge, get in the spirit of Columbus and explore your creativity! Whether art occupies every waking moment of your life or serves as a release from daily routines, iCopic is the destination for artists looking for inspiration and an outlet to share a common love for Copic Products. We hope our Copic community continues to grow and inspire every artist that comes across our Blog. Coloring Skin LaLa "Ballerina Marci"
Coloring Skin LaLa "Ballerina Marci Clothes"
Coloring TGF "My Guy Ian"
Sneak Peek of things to come. . .
Show some iCopic Love, add this button to your blog. Copy and paste the code under the badge to claim your bragging rights!